Located in the famous Dordogne valley, between the picturesque cities of Sarlat and Rocamadour, the Yelloh! Village Payrac Les Pins will be the perfect place for you to discover all of the region's beautiful treasures. Your camping holiday is waiting for you in the Lot! 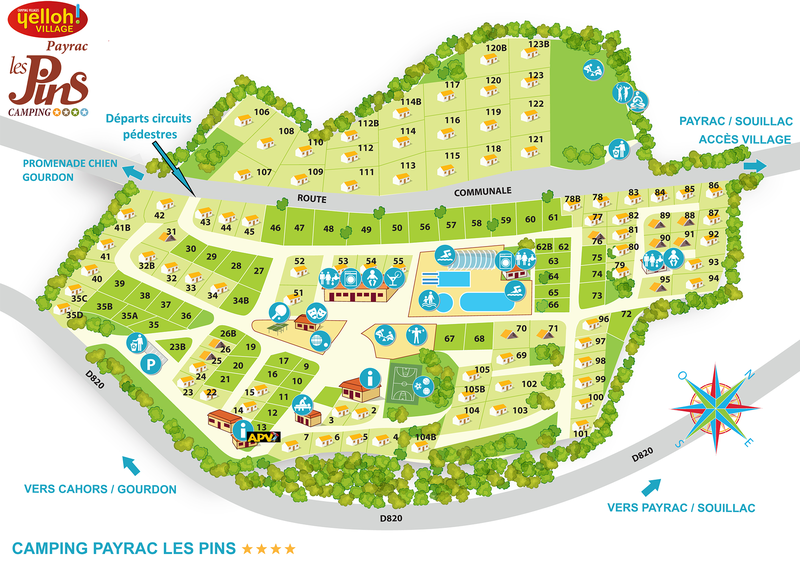 The camping Payrac Les Pins is ideally located for discovering the wonders of the Lot and Dordogne valleys. You'll feel at home in this small scale camping with its friendly, family atmosphere! Enjoy some peace and quiet during your camping holiday in the Lot. A perfect location, close to all the region's major locations, including the Lascaux caves and the town of Rocamadour. A personalised welcome, high-quality facilities and free Wi-Fi throughout the campsite! Good sized pitch, small campsite - never been so close to all the amenities, swimming facilities good for size of campsite. The camping Payrac Les Pins is the perfect place to stay for discovering all of region's tourist sites: only a few kilometres by car and you will enjoy breathtaking panoramas, world famous caves, thrilling sports and hikes in an exceptional environment. Your camping holiday in Payrac will be an opportunity for you to visit the Lascaux Caves or the Gouffre de Paridac (Padirac Chasm): you'll feel like you've descended into the bowels of the earth! There are also many of the most beautiful villages in France located right around the campsite! Domme, Loubressac, Collonges la Rouge… Why not take a family excursion to visit these villages full of history and heritage? Take a trip back in time during your stay at the camping in Payrac: Rocamadour, the proud medieval city, rises in all of its splendour! You can even take the lift to visit the castle! The Lot is also the region of savoir vivre, where you won't be able to decide which local speciality is tastier than another! Wine, duck, walnuts, Rocamadour goat cheese...a real festival for your palate!